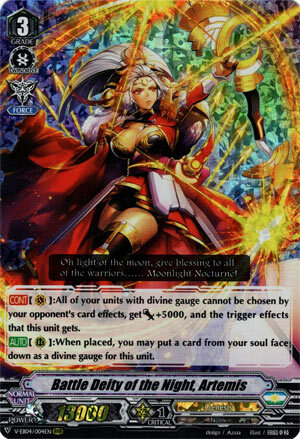 [CONT](VC):All of your units with divine gauge cannot be chosen by your opponent’s card effects, get [Power]+5000, and the trigger effects that this unit gets. [AUTO](RC):When placed, you may put a card from your soul face down as a divine gauge for this unit. So pseudo-Resist to everything with Godly Equip Gauge, along with the capacity to pass Critical triggers on. So close. So close to being an absolute pain to face. Unfortunately, she’s just a pain to USE. The only way to actually generate Godly Equip Gauge reliably is with another copy of this to call and/or the Grade 1 Artemis: The Grade 2 Artemis needs to hit and is only good on RG circle, so no VG pressure for you, sir. The card’s GOOD, but the support isn’t there. The way things stand, you’re better off centering the deck around Himiko.